The Post Navigation module is in the Post modules category, which appears only when you're editing a Singular-type themer layout in Themer. It displays links to previous and next posts, in reverse chronological order. On large and medium devices, the Previous post link is left-aligned, and the Next post link is right-aligned. On small devices, they are stacked. On the Settings tab, you can limit the navigation to be within the same category as the current post. 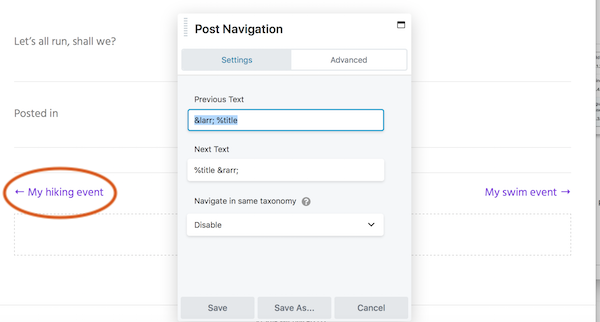 As of Beaver Themer Version 1.2, fthe option to limit post navigation to the same category is expanded to navigate within the same taxonomy to accommodate custom post types. In addition, the navigation icon and text can be customized, as shown in the following screenshot. On the Advanced tab there are the usual settings for margins, responsive layouts, visibility, animation, and assigning an ID or class name.